Can't complain about this past week at all. My workouts were on point, and we squeezed in a bit of active fun as well. Easy morning run felt pretty good! It was my first run since Feb 19. My knee was still a little wonky, but I can tell it's getting stronger. Plus, I had some pretty good tunes to sing along to on this run. Today's run was powered by Break My Stride and Roar. . This week's theme for #TunesTuesday is #motivation, and these songs were perfect. Break My Stride always motivates me to stand a little taller and run a little faster. It was the 2nd song in my playlist and really helped set a strong mood for my run. It was followed by a lot of other songs that both helped me move and take it easy. It was supposed to be an easy run after all. 😉 . As I started my final stretch, Katy Perry's Roar came on. Now, that is the way to end a run. 🎵I am a champion, and you're gonna hear me roar. 🎵 I dare you to not run a bit faster to this song. 😁 . I had such fun singing and bopping along to these two songs! . First real run since Feb 19! Knee is still wonky, but felt strong otherwise. . What song motivates you? 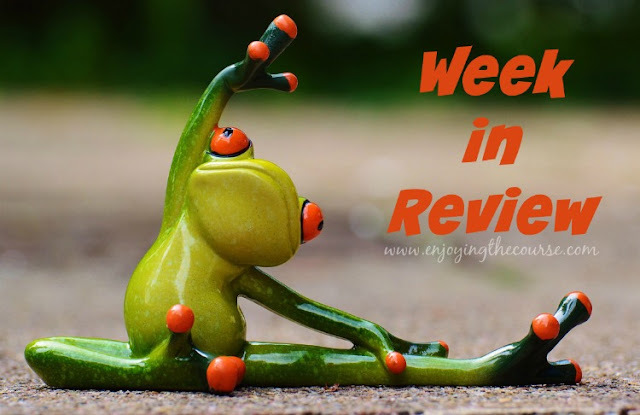 @kookyrunner hosts a linkup every Tuesday. Check it out at kookyrunner.com. After work, I did Day 4 of the 30 day yoga challenge. It's for beginners and this was our first time getting into Warrior II. I've done this pose a bazillion times, but I loved the way she got us into it and helped us check our alignment. It's such a great pose! Reality ↠ Great workouts in the morning! For yoga, we moved into Triangle pose. Another one that felt so good. Since my knee wasn't feeling 100% yet, I decided to take it easy again today. Also, I wanted to run by ConExpo again, because the cranes were amazing, and the pic I took on Tuesday didn't save properly. The first 1.5 miles, my knee didn't bother me at all, but then some tweakiness started. At the end my left knee was tweaking so badly that I had stop (good thing I was already back home). Evening's yoga was setting up for some future sun salutations. Nice and easy. Reality ↠ I worked really hard throughout the week and decided that my body needed a little rest this morning, so I skipped my morning workouts. 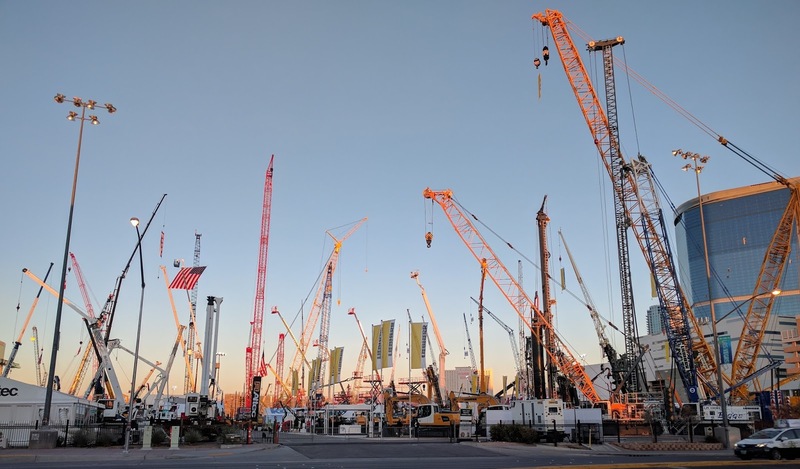 After work, Jeff and I walked over to ConExpo. I had gotten a couple glimpses during my runs, but Jeff had only driven by. He wanted a closer look. We couldn't actually get into the expo (too expensive), but we had a lot of fun walking the perimeter and checking out all the heavy equipment. After walking around, I did Day 7 of yoga. We did a little tree pose and some intro into vinyasas. Reality ↠ We knocked out March's new trail in the afternoon. I didn't use any kind of tracking, so I'm not sure how long we were out or how far we went, but I'm guessing around 3 hours. 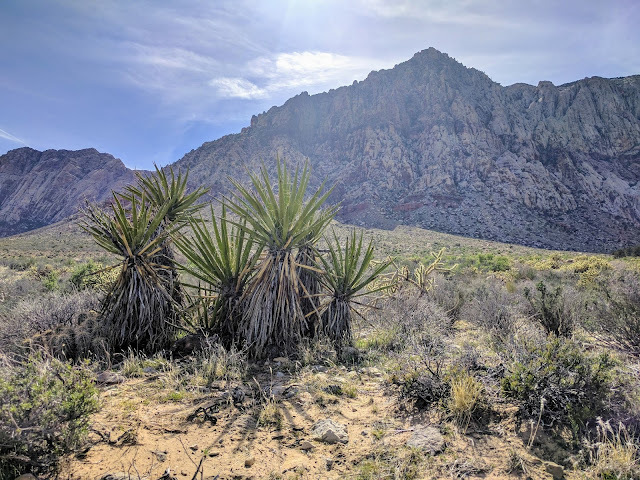 We took a ton a pics, so I think I'll write a whole post on the trail later. Pretty tired when I got home, but still got in Day 8 of yoga. And, it felt great after hiking. Reality ↠ Yoga done while butternut squash was roasting for a delicious kale salad for lunch. 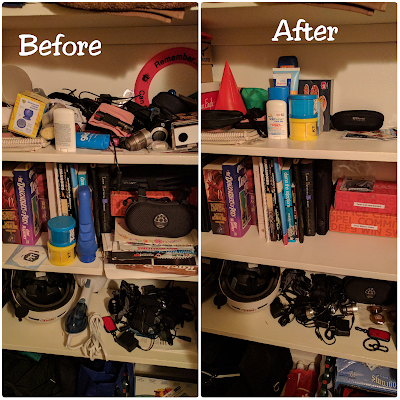 Week 10: Instead of using up an ingredient from the kitchen, I cleaned the hall closet. It's a convention/trade expo for construction. It comes to Las Vegas every 3 years. It was very interesting to walk around the perimeter! Those cranes look very cool against the sunset (sunrise?). It looks like you found another beautiful and amazing trail to hike. I'm jealous of your scenery. I cleaned out the cabinet under my bathroom sink this week (although I don't consider that a highlight LOL). The stuff that accumulates under there...ICK. Thanks for linking, Clarinda! LOL. Yeah. I'll probably avoid the cabinet under bathroom sink for a bit longer. :-D My running pic of the cranes were at sunrise, and Jeff and I walked around during sunset. I agree it made a great background. Come back on Wed to see more pics / review of the trail we did yesterday. That's awesome that you were able to get in some runs this week. I hope that your knew continues to improve and get better! I love that you were able to get some organization in this week as well! I always feel better after I organize something, especially my closets! 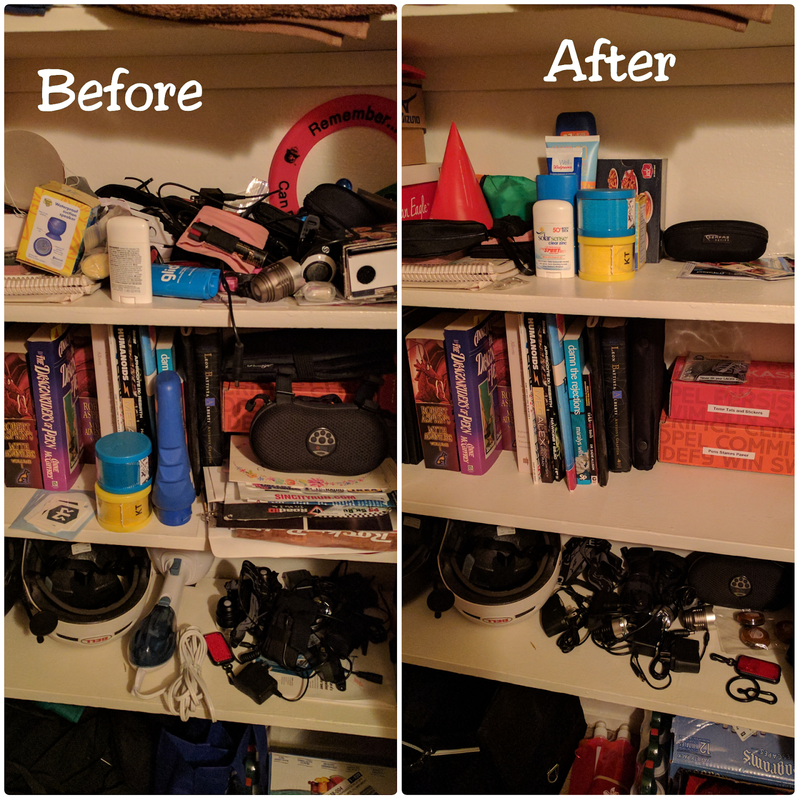 There is definitely something so gratifying about reorganizing, isn't there? I need to clean my closet and drawers out.I always feel that I have accomplished something when I do that. I bet you see a lot of cool things where you live. I love the trail pics and am looking forward to seeing more! I don't need to clean really, but I need to organize. My workout gear has gotten messy in the bins and I really need to fold and sort. I bet the scenery and different things that come to LV is never ending huh. How could you ever get bored here? It is not official yet mainly because I'm not signed up but unofficially I'll be running in the RNRVEGAS in November. I'm so very much looking forward to that whole experience! Seeing your closet post, reminds me I so need to do this to several spaces! It's amazing how some things take up residence for so long in places they shouldn't be! Oh, that is exciting! I've only run RNRVegas once, but I've volunteered most of the other years since I moved here in 2012. It is a really fun experience! And yes, it is somewhat amazing how long things stay where they shouldn't be. LOL.